I have a secret and I've been keeping for a bit. It's about my brand new kitchen sink skirt, but today I'm ready to spill the beans. Are you ready? 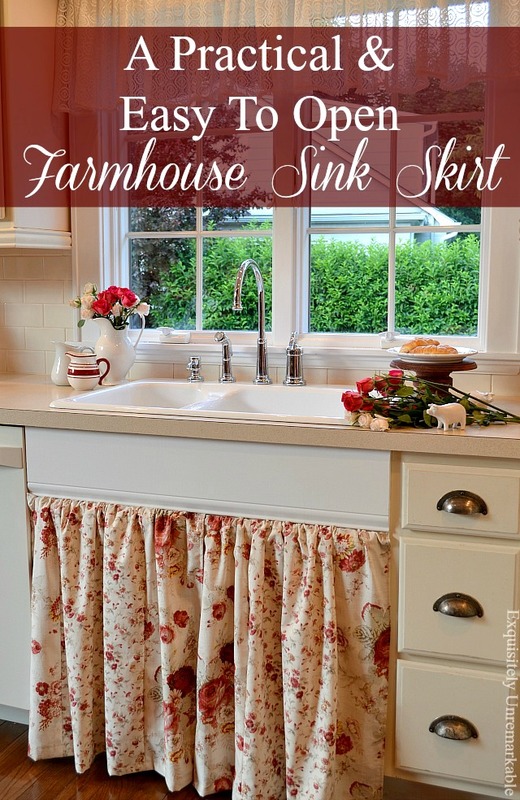 I've always loved the look of a skirted farmhouse sink. It's reminiscent of a simpler time and adds so much charm and character to a cottage style kitchen. It's been on my decorating bucket list for as long as I can remember. 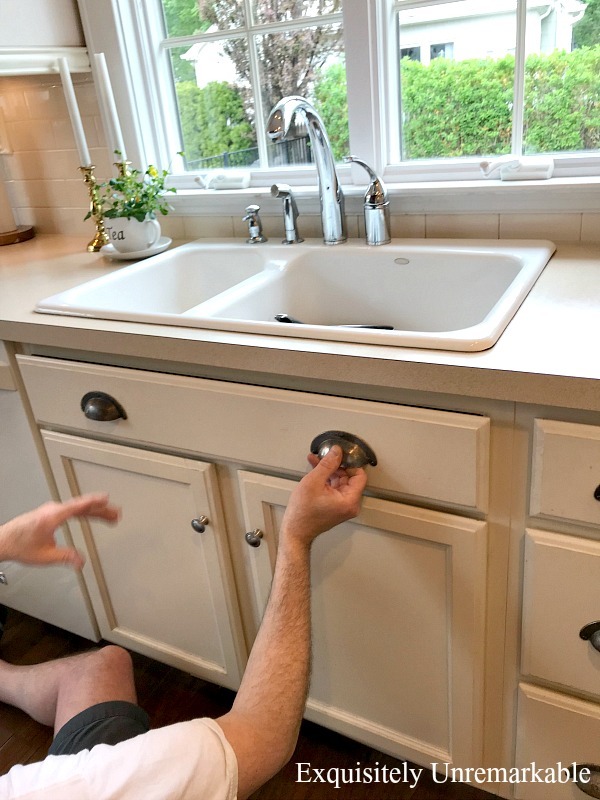 Unfortunately, when we replaced our faucet, we discovered that apron front drop in sinks for laminate countertops were no longer being manufactured. Grrrr. However, being the stubborn Sicilian girl that I am, I refused to take no for an answer and was determined to find a way to make a skirt work without that apron front sink. Once I really started thinking about it, it wasn't as simple as adding some fabric and calling it a day. I had a lot of reservations...and a lot of requirements. - First and foremost the skirt had to look good. Really, really good. I wanted to capture that authentic cottage style whimsy. I didn't want something that looked like an afterthought, out of place, tucked under the laminate, like a bunch of fabric hanging in a modern kitchen. - Second, it had to function well. The garbage pail is under the sink and everyone is used to it being there. That wasn't going to change. We also keep the cleaning supplies under the sink. 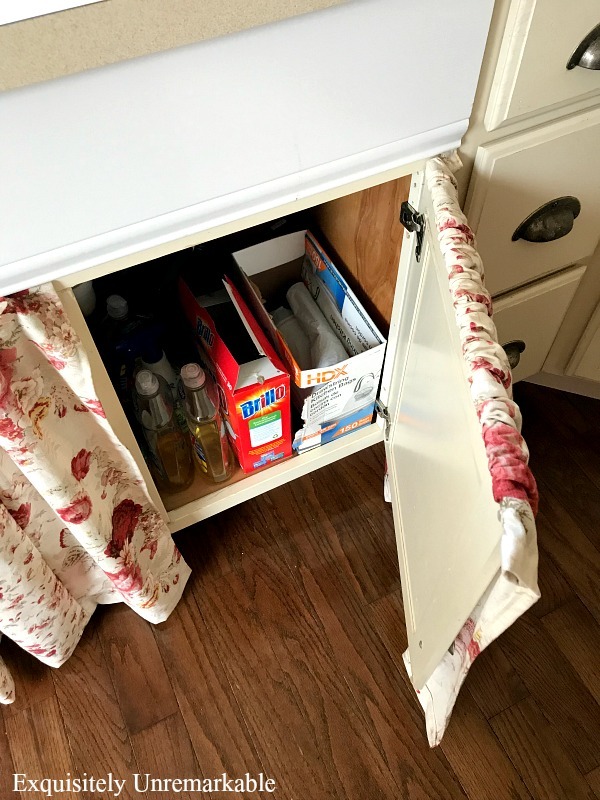 I needed a solution that would give us easy access...as easy as we had with the cabinet doors. 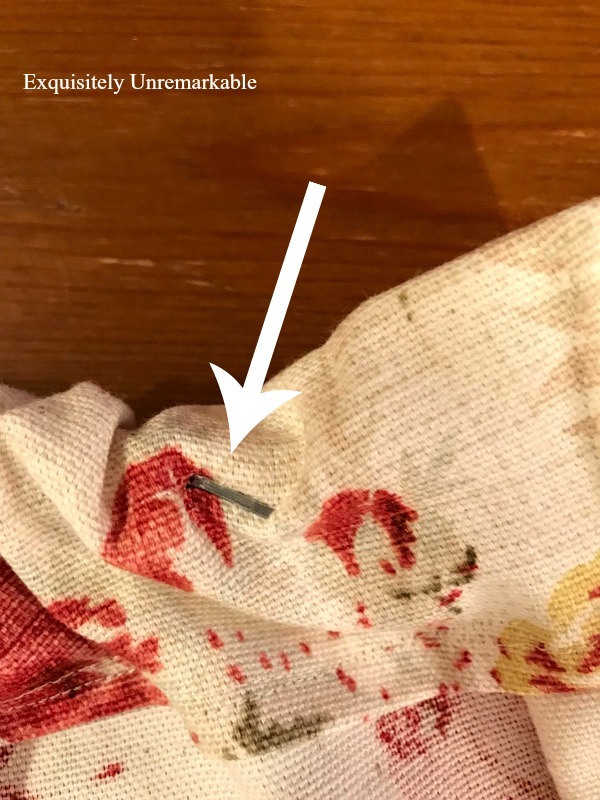 Fabric on a rod doesn't always move smoothly, even with rings. - Third, it needed to be very sturdy. I have teenagers and a husband, none of whom were going to be as gentle opening and closing that curtain as I would like, no matter how many times I asked. This is reality folks. I needed form and function. - My last requirement was that it needed to be temporary. 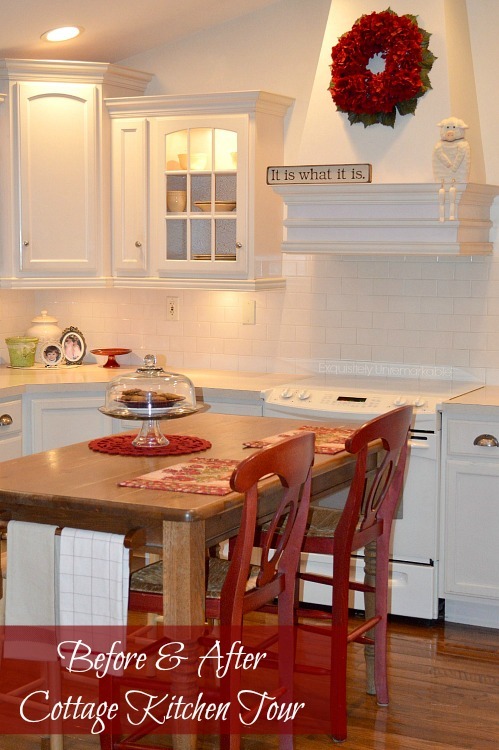 Let's face it the kitchen is the most important room in the house when it comes to resale. Now, I rarely, if ever, decorate with that in mind, but I didn't want to irreparably alter the cabinets. They're in perfect shape and I wasn't willing to mess with that...cabinets are a huge investment. A tall order...but clearly, I have a skirt. So what was my solution? Well, that's the secret. You see, my skirt isn't really a skirt. It's a fake...a fraud...it's fabric mounted on the cabinets and the doors still open. Now, I have a gorgeous skirt. The doors function perfectly. It's sturdy, nothing has been damaged and no one has to slide or push anything out of the way. And I couldn't be happier with the way it looks. Charm, whimsy, function. It's all there. And we didn't even scratch the cabinet doors. So how'd I do, it? Well, this won't be a short post. if you're ready to check out now, I totally get it. If you want to hang around to see the full DIY tutorial. Great. Here we go. The first step actually begins above the skirt. To add a little more interest to the sink area and make the skirt look as if it wasn't just stuck there, almost as if it's a piece of furniture, we replaced the cabinet panel with a piece of moulding and painted it white. 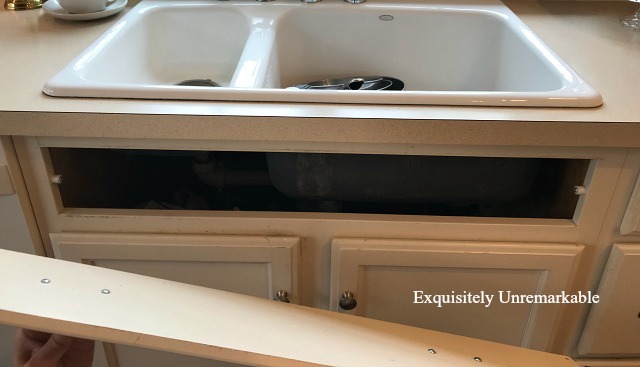 We started by removing the existing cabinet panel from underneath the sink. It's easy to do, it's usually a piece of wood that just clips on and pulls off. You don't need to use a lot of force, just a tiny tug should do the trick. To create a new panel, we perused the aisles at Home Depot until we found a simple moulding piece that fit our style and had them cut it to size for us. At home, we removed the clips from the old piece and placed them on the back of the new moulding and popped it right back into place. The next step took some thought. Like I said, we didn't want to do anything that would permanently damage the cabinets and we needed a skirt that was very functional. Most of the skirts I had seen online were hung either with mounted rods or tension rods. A exterior mounted rod was going to leave screw marks. That was out. A tension rod was going to need rings so it would open and close with ease. This was an option in theory...but not in reality. I was afraid people would pull on it and it would fall down often. More importantly, I didn't want to have to cut out the bars in order to make the tension rod fit. Yes, with some work we could add them back, if we wanted to put the cabinet doors on again, but what if I got sick of the skirt in three months? That would be a lot of work for a decor experiment. What I really needed was something like the cabinet doors, that would open and close the same way. I came across swing arm curtains rods online and thought I found my solution. Then I read the reviews that said they drooped in the middle...and again, they mounted from outside...and I didn't want holes in the cabinet frame. Then it hit me. We had extra cabinet doors in the basement. I would just mount the skirt to the cabinet doors and easy peasy, they would be sturdy, not droop, open and close with ease and they'd be child and husband proof. Yeah, well, not quite. The cabinet doors were gone, tossed when we got the new ones. Ok, no problem, I would find an old pair in the trash...which was taking way too long (like this story!). Finally, my husband said, what if I turned this pair upside down? 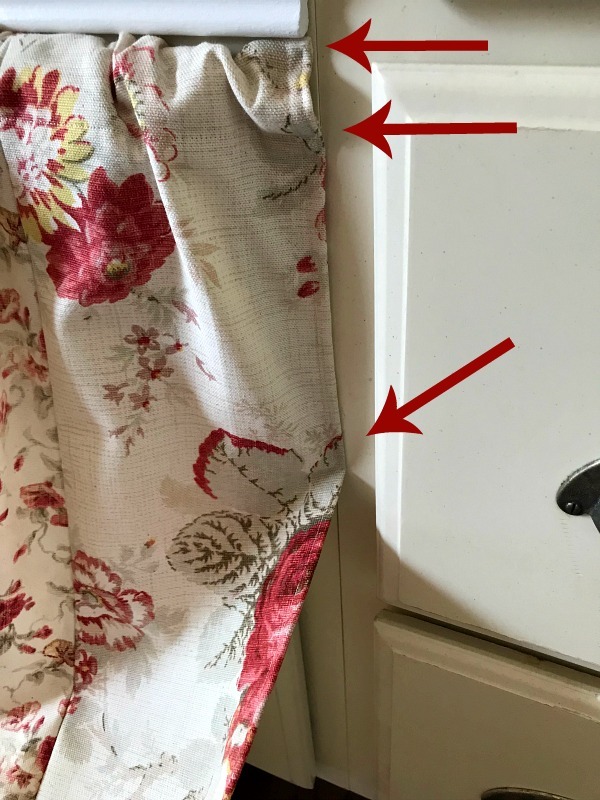 We could screw the curtains into the bottom of the doors and if we wanted them again, we'd turn them right side up, and they'd be perfect once again. So literally, we removed the doors, flipped them upside down and swapped their places, so we didn't have to move the hinges, and screwed them back into the existing holes. Now, it was time to make the skirt. That part was simple. I basically made two rod pocket panels, using the exact same process as when I skirted my living room table. Instead of curtain rods, I used wooden dowels and gathered the skirt panels on them. I cut each rod about an inch longer than the door. I wanted a bit of an overhang in between the doors, so the fabric would overlap and hide the fact that it was two separate panels. Once I had the drape I liked, I used a staple gun to secure the skirt in place. I only used two staples, each one was about an inch from the end. 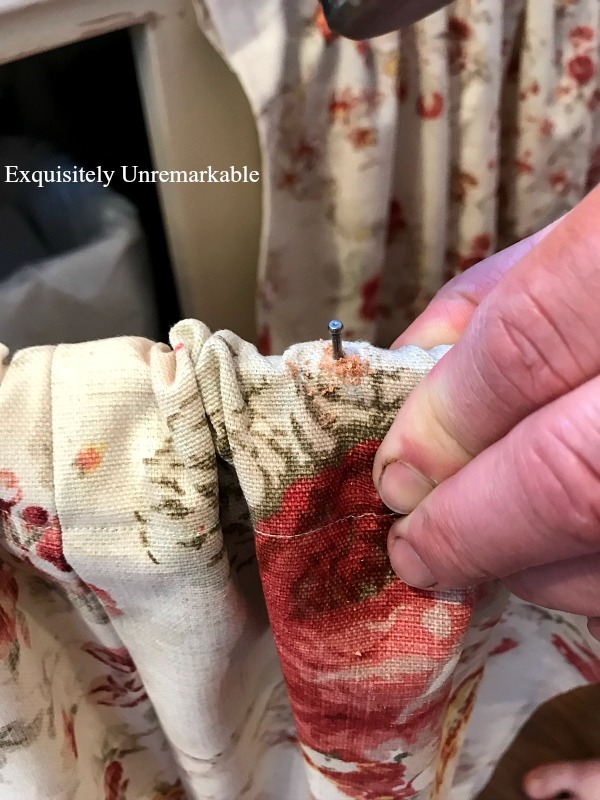 That allowed me to adjust the ruffle in between, keeping it loose and flowy-looking, and anchored on the dowel at the same time. 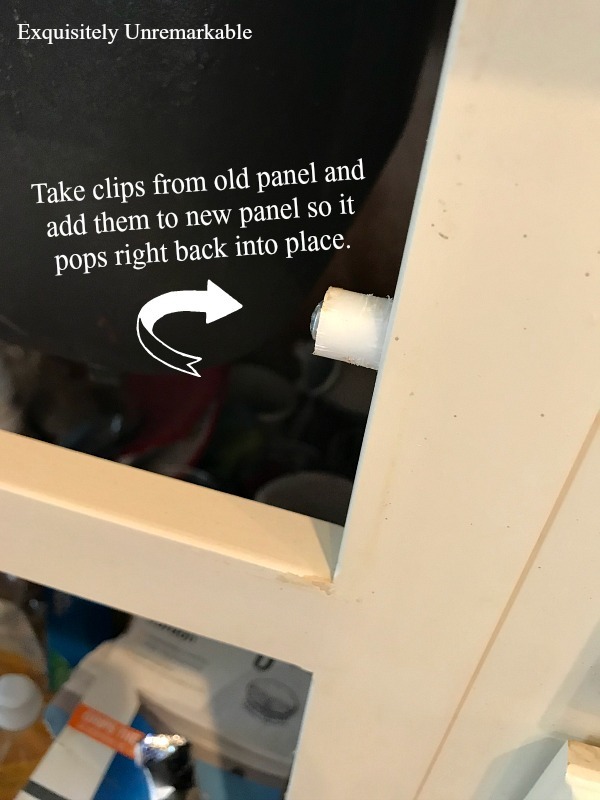 To attach the rod to the cabinet, we used two tiny finishing nails, right through the fabric, the wooden dowel and into the cabinet. Since the skirt sits right next to drawers and a dishwasher, I did add a drop of hot glue in a few places to make sure it doesn't move too much and get caught in either. And that was it. I wish putting the sink in was that easy! If I get tired of the look or we need to put the cabinets back, no problem. 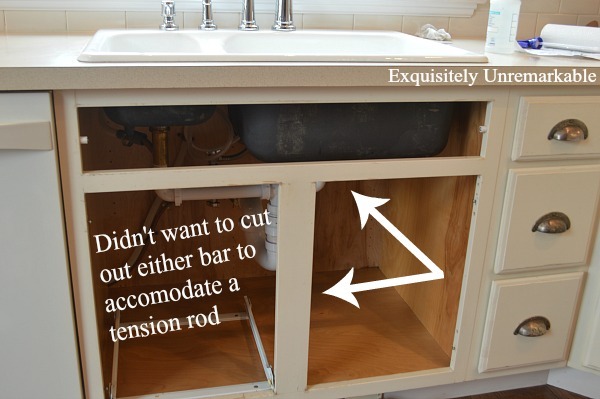 We just remove the dowel, flip the cabinets right side up and screw them back in place. No harm, no foul and no one will be any the wiser that there are two tiny holes in the bottom of each. But why would I ever want to remove that sweet, sweet skirt? It looks so good!! This is a very clever DIY project. Great job to you and hubby. Can I hire you to do my kitchen sink skirt? :-) I want one now! Thanks AnnMarie! We do make a good creative team. We're both pretty stubborn once we get an idea in our heads...we need to make it work! Lucky for me, he enjoys a design challenge, too. This is genius Kim. What a great idea. Now you have me thinking about my cabinets under my sink! Hmmmmmm! I will have to find pre made skirt since I do not own a sewing machine and probably would have a hard time even sewing a straight line lol! Love that you used two coordinating fabrics too. Super sweet. You go girl this is fabulous. Thanks so much, Deanna...and me too. I just keep buying more of it! You always inspire me. I've been trying to figure this out as well - and I just love that fabric! Thank you so much, Betty! I wracked my brain with this one...and that fabric is my weakness. I think I need to buy stock in Waverly! Ha! Brilliant!! And lovely. And so Kim! Genius, indeed! I agree with you, Mr. Handy Dandy and you make a good creative team. Cute skirt! Hugs. Thanks so much, Nancy! I'm really happy with the way it turned out and the family is thrilled that they can still get to the garbage pail! 😉 Win, win! Hugs to you and your own Mr. Handy Dandy. Wow How cute. Never would have thought of that solution. Thank you so much. This one was a brain teaser for sure. I'm glad we didn't give up though. I love it now. That is the smartest idea I’ve seen. I love how it turned out. Thanks so much! I really did want it to work out, so I didn't give up. It changes the whole look of the kitchen for sure. How genius is that. I love it. You outdid your self on this one. Thanks so much, Marty! I really wanted that skirt to work. manipulations! Beautiful kitchen for sure! Thanks so much, J! We had fun with this one. We really had to work together to make this all come together. Two heads are better than one. This is so cute and clever---glad you gave us a close up of the skirt, I thought it was simple cotton but its a lot more durable. I love the whole look. I have one question. 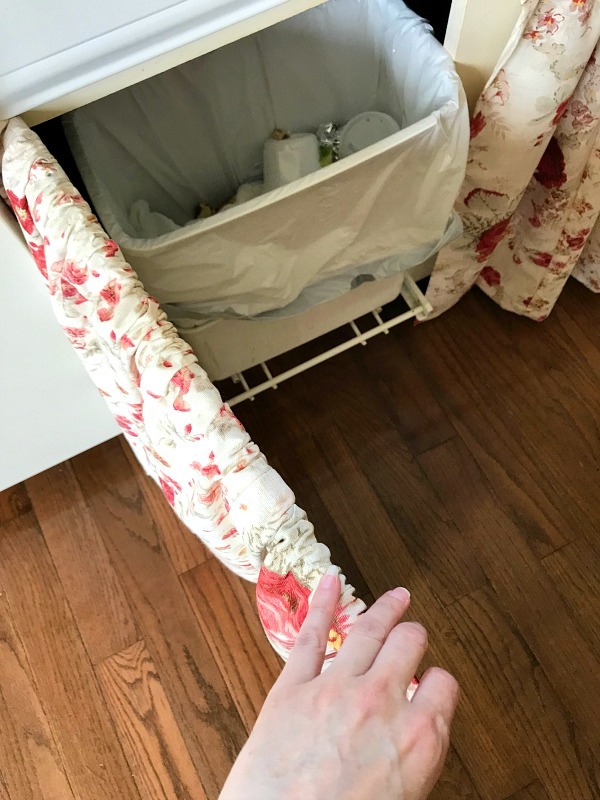 I never wanted to keep the trash can under the sink because I knew it would be hit or miss and I'd constantly be on my hands and knees cleaning up a mess in a dark cabinet. Do you have this problem? Thanks Jane! I'm so happy with the way it turned out, and yes, it's upholstery fabric. Very sturdy. It's also a busy pattern to hide messy spots...but so far there aren't any! 🤞 Our garbage pail has always been under the sink because in these tiny cottages floor space is valuable real estate! Occasionally, there's a miss, but more often than not, they make it. And it's great right under the sink...pulls out and everything! What a clever solution, Kim and it looks perfectly cottage chic! 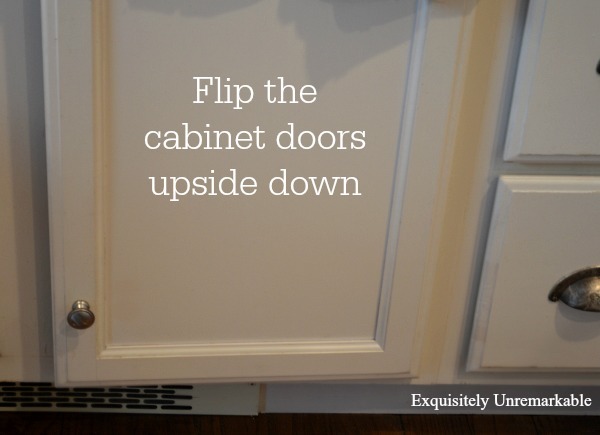 The way you kept your cabinet doors is genius . . . I took the doors off and added a curtain rod. Same look, but having the doors still there is much nicer for keeping the storage more secure and safe from curious small children. Thanks for sharing . . . your kitchen is lovely and your curtain is very pretty. The ideas you come up with amaze me. 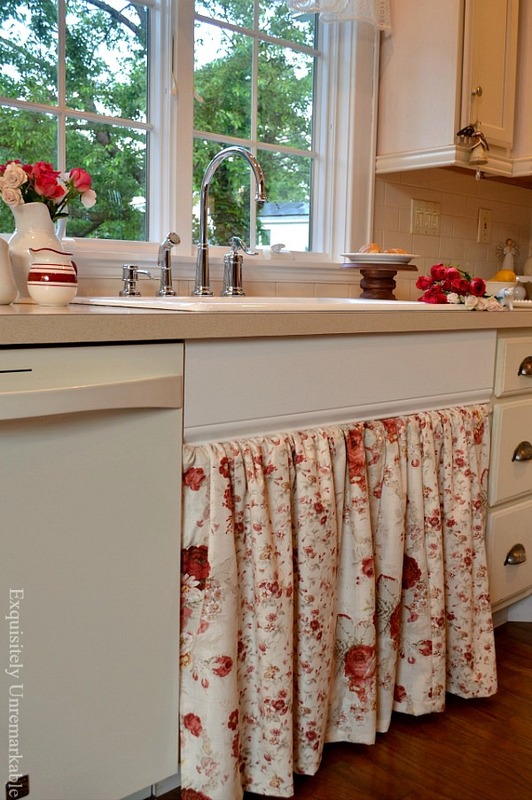 The kitchen sink skirting looks fab-u-lous . . . Thanks Cheryl!! I am happy that the secret's out now! Once again you've solved a situation beautifully! You and your hubby are a creative/smart team. Your curtain looks amazing. Thank you so much, Stacey! He is so good to me, always indulging my crazy DIY dreams. Kim this is adorable. It really adds to the overall farmhouse look. I really like how you went about it with those panels on the inside. Kim, you are so smart. One smart cookie I say. :-) It looks great and thank you for the tutorial. Well done. 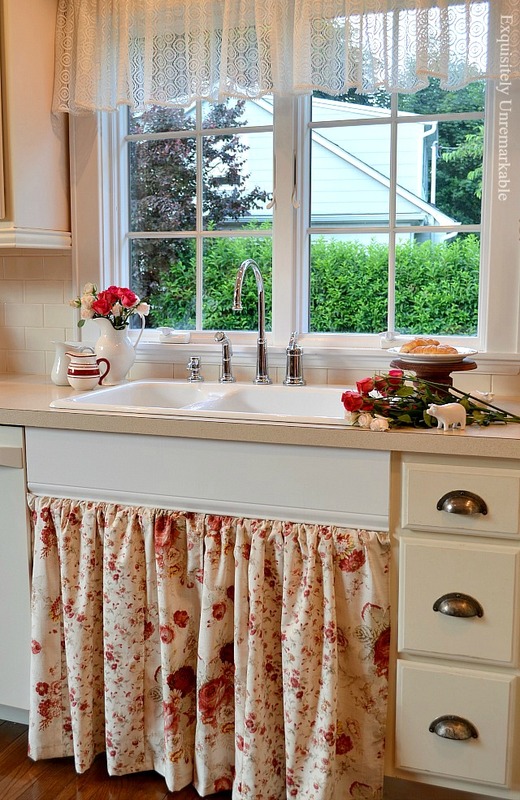 That is so clever, Kim, and looks very sweet with your pretty lace valance! Thanks Carol! It really transforms the whole room. That is so clever of you !! Yes you are a genius :) In a million years who would guess it wasn't an ordinary 'curtain' or skirt !! 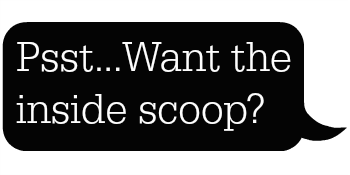 Jann, you most certainly are, I have seen your blog. I was very determined on this one. I hope it helps someone else who wants to do the same thing. I don't think you'll get tired of it. I absolutely love it! In my opinion, you now have the most "cottage-y" home in Blogland. And I still like cottage better than farmhouse style. H! So how do you open the doors? Do you grab the end of the dowel rod? The curtain? Will the curtain soil from dirty hands? Pure genius! Mind you, I don’t know how you pulled it off (slow on the uptake) but wow, it looks so pretty and the fabric s couldn’t be more perfect for your kitchen. You’re the most resourceful person I know Kim! Wowzers Kim!!! I LOVE your kitchen sink to bits!! I also adore the fabric that you chose for underneath!! I bet this makes you want to and enjoy doing the dishes!! Beautiful job!! Thanks so much, Sam! I really do love the sink now...and yes, I am telling everyone to leave the dishes. I'll do them!! Sometimes that stubborn gene comes in handy!! It is very cute and clever! Amazing! 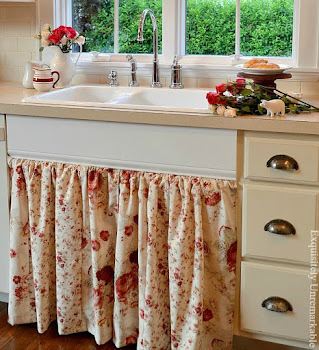 I can't imagine that you will want your sink skirt less again - it is so sweet. Thanks Ronda. I've been thinking the same thing! SOO pretty and perfect, even for a rental home! Congrats on your feature at Sweet Inspiration! Great idea for a rental, Julie! Never even thought of that!! You are one crafty girl, Kim! It looks beautiful and classy, and I adore the fabric you've chosen. This is so pretty an ingenious as well. I am working on updating an RV so perfect timing. Thank you for the inspiration. Pinning, I love it. Oh my gosh...in an RV?? Another great idea. I am so glad I shared, I never even thought about these options. love this, but I got the look by taking off the front and putting a tension rod across to hang my slide curtain ..only need a screw-driver ....I have to go with the easiest since I had no man to help me...and I'm not that handy anymore at 65. Sounds like you're pretty handy to me! Lots of folks wouldn't have even attempted that. I bet your skirt is lovely and honestly, if I didn't have a houseful of teens who would pull on the rod, I would've gone your route, too. Simple is always best. Thanks so much for the visit and the comment! ANYWHO...I have always had the curtained sink in my plan and am so excited to finally get what I want. I love yours so very much! It’s just timeless. Would you mind sharing the name of the fabrics used? 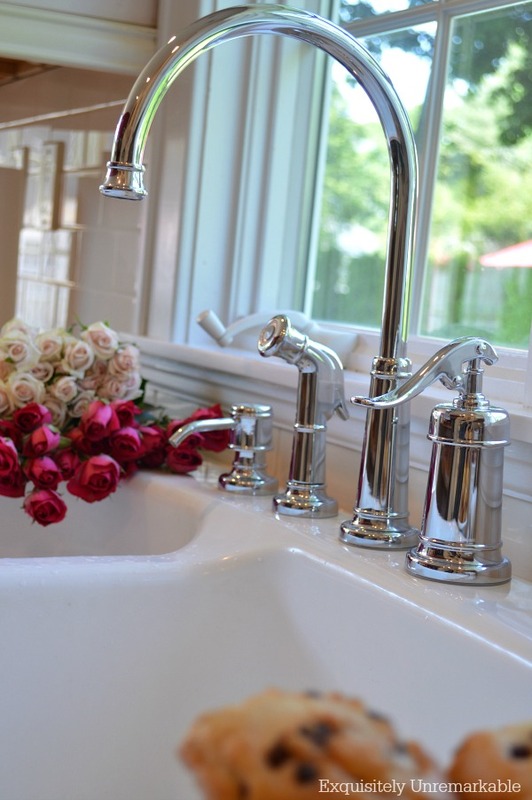 I also love how you put them on because to be honest I love the look that you have because I’m really not all that fond of the farmhouse sinks of today. If I ever did get a farmhouse sink it would be a true antique. I also love your home very much! You just totally made my day with your sweet, sweet comment. Thank you for the kindness. Sounds like you are in the middle of a lot of renovations. The never-ending story of home ownership. Sounds like you have a handy hubby yourself. That's awesome! The fabrics I used were both from Waverly....Norfolk Rose and Fairhaven Rose. I patched them together and I should probably do a post about that...someday! I picked them up at JoAnn Crafts, they were 50% off. I know they also sell them online. 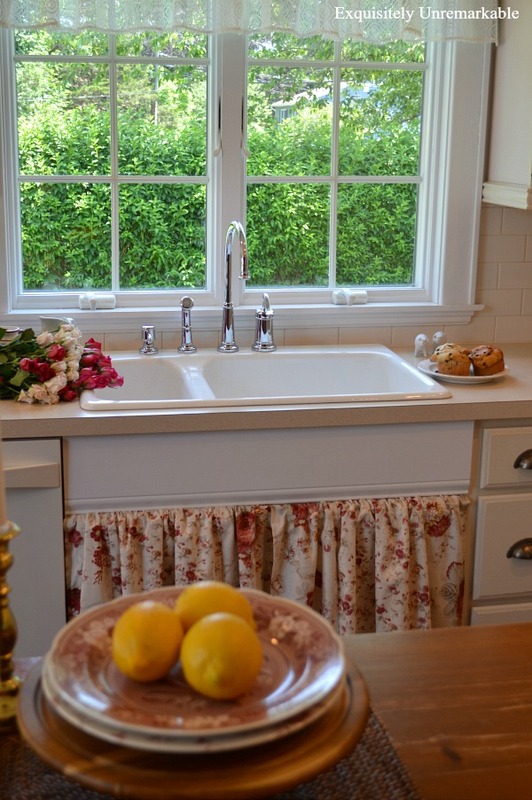 And I agree, the antique farmhouse sinks are fabulous. I wish you luck with your projects and if you do remodel your kitchen, I hope you'll share it with us!! Have a great afternoon!! When we do remodel, I will definitely try to remember to send you an update. Actually I’m not sure that my husband has ever done plumbing before but after calling a plumber and finding out what the actual problem was he just took it upon himself to put it in. I’m glad he did because that saved us a good deal of money but he actually just wanted our warranty company to handle it, only to find out faucets aren’t covered under our plan. Long long story but we will be looking for a new warranty co. So anywho...thank you for letting me know what fabric this is. I am totally in love with both of them! Oh and about the “handy hubby”...he’s very handy at running the remote, anything else...no not so much! I generally do it all myself unless I can’t. Please share for sure! And being handy yourself is awesome! I wish I was more handy myself. I have to wait on my own handy husband far too long for certain projects. He'd much prefer to run the remote sometimes, too! !